Create a lifelong impression upon the ones you adore by gifting them this Straight from the Heart V-day Gift Combo that clearly conveys how much you love them. 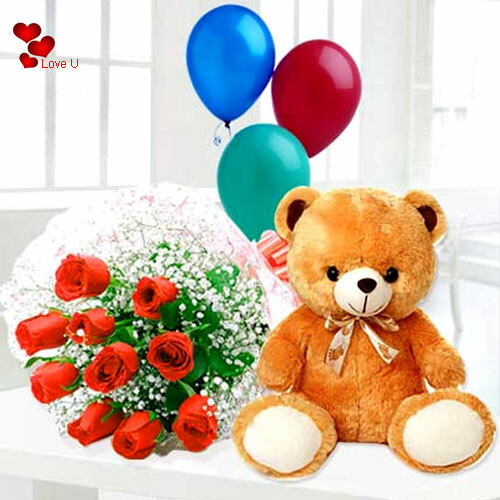 This Gift will make a lovely V-day collection as it features 8” tall Teddy and 3 Colorful Balloons with a charming bunch of 12 Red Roses. Flowers Delivery Calcutta, Send sweets Khammam, Wedding Cake Amravati, Diwali Mithai New Bombay, Send Flowers and Gifts to Karur, Online Shop Mohali, Flower to Gopi, New Year Flowers Karimnagar , Fresh Fruits Nashik, Send Gift Mohali, Dry Fruits to Lucknow, Birthday Delivery Kumbakonam, Sending to Jalgaon, Flower shop Rohtak, Lucknow Online Cake Delivery.